Returning to London in 1817, Sir Martin Powell is ready to put a life of political intrigue behind him but the Prince has one more assignment before he can do that. He's sending Sir Martin to the English Midlands to investigate rumors of an uprising against the Crown. Before he leaves London, at the urging of a friend, Martin pays a visit to an exclusive brothel. Still grieving the death of his beloved wife and unborn child on the streets of Paris during the war, he has no interest in a romantic entanglement but one night in the arms of a skilled courtesan will help him forget, if only for a few hours. It should have been that simple, but when Martin confuses the brothel owner's directions and opens the wrong door, what he discovers is a woman who will challenge everything he thinks he wants...and does not want. Life has not been easy for Katherine, Lady Edgerton. The daughter of an earl, Kit is married off to a man old enough to be her grandfather who then dies shortly after their marriage, leaving her with very few resources. She moves in with her ailing sister and brother-in-law to care for her sister but cannot help but be wary around her sister's cruel husband, the Earl of Rutledge. Her sister has barely taken her final breath when the man tries to force himself on Kit, telling her she was the one he had wanted all along and now meant to have. Escaping, Kit takes refuge with the only person she can trust, her former nanny, now the owner of an exclusive brothel. When Martin accidentally enters her room, Kit is intrigued by the handsome man with the gentle manner. Still shaken from her earlier encounter with the Earl, she's soothed and intrigued by this man who treats her with reverence and makes a decision that will change the course of her life. 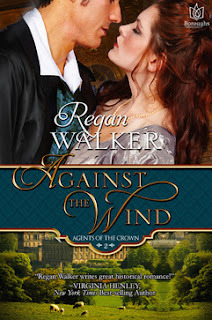 Regan Walker once again seamlessly blends together real events and people with fictional characters and her own imagination in a book that flows beautifully from beginning to end. Following the war with France, England enters a period of social unrest and economic change, a tumultuous time into which Walker's characters are plunged. Danger surrounds them as Martin, who marries Kit to keep her safe, works to prevent a revolution while at the same time nurturing a relationship with his new wife while keeping her in the dark as to the reason they are really in the Midlands. To the passion that flares between them from the beginning, they slowly forge a friendship that gradually deepens into love. Danger, Martin's secret life and a nasty villain bent on revenge against Kit, combined with the peaks and valleys of a marriage of convenience that is evolving into something more, give us a story that's sure to keep readers, as it did me, flipping pages late into the night to find out what happens next. Walker's books are impeccably researched, immersing the reader into the time and place in which they are set. Her characters are well formed and believable. Kit and Martin had me rooting for them from the beginning. Martin, in particular, won my heart with the way he treated Kit. Secondary characters add to the richness of the overall story with those from the first book in the series giving readers a peek into their post-HEA lives and introducing Martin's brother, the hero of the next book, an intriguing privateer I can't wait to visit again. While this book stands on it's own, if you're like me, once you finish Kit and Martin's story you'll be off to pick up a copy of the first book in the series, RACING WITH THE WIND as well as counting down the months until the publication of the next one, WIND RAVEN. In the meantime, why not pick up a copy of AGAINST THE WIND. I highly recommend it. I already know that Regan Walker is a great author and this novel of hers sounds fabulous. I love the plot and am adding it to my Wish List right now. I just came across this book the other day while doing a search for books. It sounds very good and your review was really good, PJ. I hope you enjoy it, Deb. Walker's stories are rich with historical detail (which I enjoy) but without coming across as a history lesson. The people and events are so seamlessly woven into the story that you absorb the facts almost without realizing it.